Angammal Agro Foods is an imminent manufacturer of edible oil, exclusively sesame oil, based in Madurai, Tamil Nadu. Entering the industry in 1976, our noteworthy accomplishments distinguish us from other traders and distributors from our region. With the existence of our very own other 3 sister concerns specifically, Annamalai Oil Store, Geeta Oil Traders & Selvi Ennai Peruvanigam the reputation for best quality and customer satisfaction precedes us. Our presence in this oil trading business for 3 generations has helped us channel our own manufacturing unit since 2013. We have a well-established in-house manufacturing unit facilitating a production capacity of 2000 kg oil / day. Aadimaa, the superior and healthy cooking oil available in India. 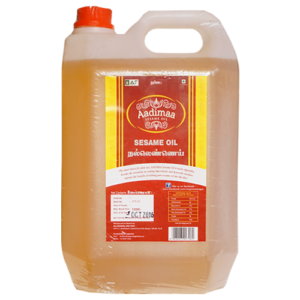 Aadimaa sesame oil is manufactured in traditional approach with modern technique thus preserving its nutritional value and flavor. Now add more taste to your life.. Aadimma sesame oil manufactured with superior sesame seeds, superior cleaning process with traditional manufacturing methods. One of the most genuine oil brands from Madurai. The taste and aroma itself talks for its quality. When we first used it the taste increased so much that we were surprised to know sesame oil had such taste in the first place. 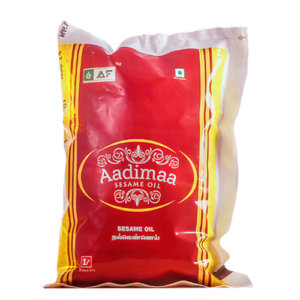 I am using Aadimaa Sesame Oil and my family is fully satisfied with this products which is taking care of our health and expecting more natural products from you. Thanks..
Aadimaa sesame oil authentic Good quality and well packed product at reasonable price. Worth buying. My concern and saying is that what is point of having money with bad health. Try Aadimaa chekku oil and you will realize the benefits from it. This is the first time using cold pressed oil. I feel the real taste of cooking oil. I thought cooking oil doesn’t have smell and its odorless. But now I realize myself it has good natural smell. Making dosa with Aadimaa Sesame oil which give wonderful taste.